Rather than using ugly silver fillings, which can ultimately weaken back teeth, we use tooth colored resin fillings. Tooth colored fillings, also known as composites, are made of non-reactive, durable resin and porcelain materials that can be matched exactly to the color of your natural tooth. These restorations are strong, natural-looking, and minimize the amount of tooth which must be removed. Inlays/Onlays are lab fabricated fillings that are made similar to crowns. They are used to restore large cavities. They are indicated for cavities that are too large to be restored with a simple composite filling and too small to be replaced by a conventional crown. They have the additive benefits by conserving tooth structure and adding strength/durability to the restored tooth. Upon placement, they are virtually undetectable in the mouth. Often referred to as "caps", Crowns are dental restorations that are covered to fit over teeth. Crowns are appropriate when the cavity is too large to be restored with a simple filling or inlay/onlay for fear of possible tooth fracture. Crowns also serve to restore teeth that have had root canal therapy. The restored teeth are "caped" to prevent possible fracture and possible tooth destruction. Crowns can be made from different materials which included non-metal all ceramic crowns, traditional porcelain fused to metal crowns and the all-metal crown. You and our doctors will decide which type of crown is appropriate, depending upon the strength requirements and esthetic concerns of the tooth involved. When a tooth is missing, a bridge is used to replace it. A bridge spans the missing tooth space and uses the adjacent teeth next to the space as a stabilizer. The fitting of a crown/bridge requires at least two appointments. During your first visit, the tooth is prepared for the crown, a mold is made of the tooth, and a temporary crown is placed over the prepared tooth. At the subsequent visit, the temporary crown is removed and the final crown is fitted, adjusted and cemented into place. Veneers are probably the most esthetic means of creating a more pleasing and beautiful smile. These restorations can perfect your smile by masking stains, hiding chips, correcting misalignment, and creating uniformity. Veneers are made of ultra-thin porcelain materials that are designed to offer vitality and beauty that is indistinguishable from your healthy natural teeth. When veneers are bonded with today&apos;s adhesive technology they are extremely strong. In general a thin layer of tooth is removed to allow a custom porcelain tooth facing to be bonded to the tooth. Most importantly veneers allow for conservation of natural tooth structure and are an excellent alternative to crowns. Benefits of veneers includes lighten dark or discolored teeth, fix fractured or chipped teeth, and straighten crooked or misaligned teeth without the need for orthodontic braces. Veneers can also close unsightly gaps between teeth and increase the length and size of teeth that have worn town with time. Dental implants are a wonderful replacement option for the root portion of lost natural teeth. They look and feel like natural teeth and they are appropriate for almost anyone who is currently missing teeth or at risk for losing teeth. Implants are usually made from metal called titanium, which is readily accepted by the body. There is a phenomenon called osseointegration , meaning the titanium is so compatible that bone actually attaches itself to the implant. A laboratory-fabricated crown similar to natural tooth is then cemented over the implant. The advantages include the ability to restore a missing tooth without altering the teeth on either side of the space and increase stability of dentures while reducing long-term bone resorption. A sparkling, bright smile can make a big difference for everyone. Zoom! Advanced Power is the latest most technologically advanced bleaching system available. 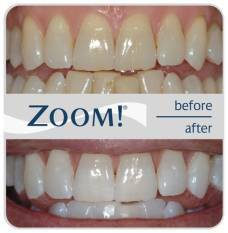 The Zoom whitening gel is applied and then a safe blue-plasma light enhances the penetration of their patented bleaching gel, resulting in changes from six to ten shades in a single one-hour appointment. A five-minute fluoride treatment completes the procedure. You will be amazed with the results.